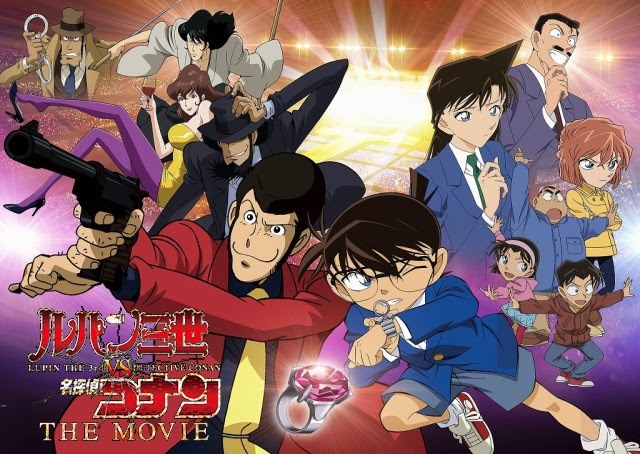 Lupin III vs. Detective Conan The movie is out this Saturday (7.12.13) at theatres in Japan. After the success of the previous crossover back in 2009, fans from around the world wanted to see more of our two heroes but on a grander stage. Early this year it was announced that production of a movie was underway, afterwards teasers showed just how action packed it would be. Now the wait is almost over as the movie will hit screens this Saturday. "Cherry Sapphire," an illusive secret treasure that holds the key to the entire world, will bring the two in a "head-to-head confrontation." Lupin is suspected of stealing the gem, and "when the truth is revealed, the curtain will open on the greatest battle in the world."